Tender clams, sustainably harvested from the cold North Atlantic by generations of local families, bring the taste of the sea to your table. 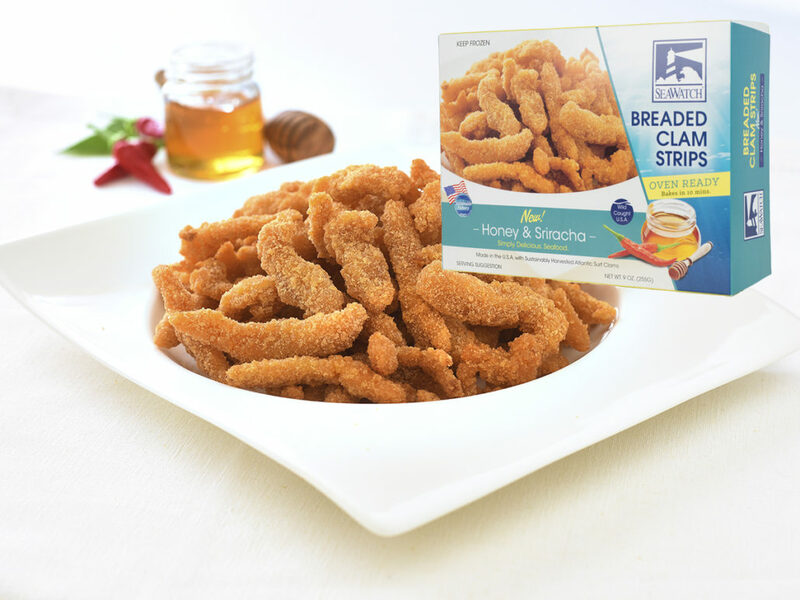 Breaded clam strips, seasoned with honey and Sriracha, deliver a subtle blend of “sweet and spicy” to the crispy finish! Oven-baked or fried, they’re ready in minutes for tasty snacks, to fill hearty clam rolls, or as a delicious protein on your healthy salad. Of course you could bake them in the oven but they never had that awesome combination of Tender and Crispy that you get from the old deep fryer. Now you can get that tender crispy crunch from the oven. Through Sea Watch’s revolutionary process, the performance of the Oven Ready Honey & Sriracha Clam Strip has equaled that of a fried product and in some cases been preferred. maltodextrin, garlic powder, hot sauce (aged cayenne peppers, vinegar, salt, garlic powder), guar gum, onion powder, wheat gluten, nonfat milk, citric acid, natural flavors, extractives of paprika, vinegar, yeast extract, honey, eggs, sodium tripolyphosphate (to retain moisture), modified cellulose, enzymes, dextrose.